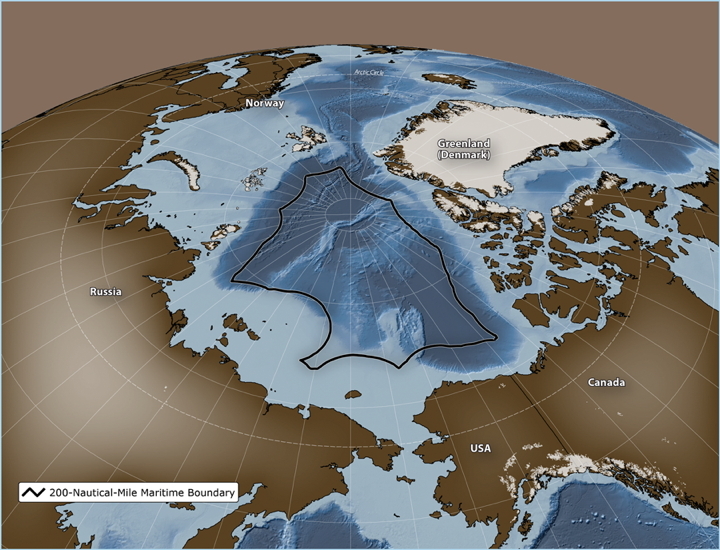 This map shows a 2.8-million-square-kilometre area of international waters in the central Arctic Ocean, beyond the 200-mile zone of the five Arctic coastal states: Canada, Russia, Norway, the U.S. (Alaska) and Denmark (Greenland). The Arctic Ocean is Earth's northernmost body of water. It encircles the Arctic, and flows beneath it. Most of the Arctic Ocean is covered by ice throughout the year—although that is starting to change as temperatures climb. Pale and stark on the surface, the Arctic Ocean is home to a stunning array of life. Though it's the world's smallest ocean—spanning 6.1 million square miles—the Arctic is now receiving unprecedented international attention. Scientists are racing to understand how warming temperatures will alter Arctic Ocean waters—and by extension the rest of the climate—and world leaders are racing to control newly opening waters. The Arctic Ocean is warming faster than anywhere else on Earth and feeling the onslaught of climate change. The U.S., Canada, Greenland, Iceland, Norway, and Russia all have territories that reach into the Arctic Ocean. About four million people live in the Arctic region, many of them indigenous groups that have thrived there for millennia. To survive in the harsh climate, many of the region's people rely on the ocean's bounty to sustain their livelihoods. This includes fishing, sealing, whaling, and other activities. The Arctic's otherworldly landscapes are also increasingly drawing tourists to the region. As once impenetrable sea ice becomes less stable, Northern Hemisphere countries have begun to take a greater interest in the Arctic as a path for shipping lanes, military presence, and commercial opportunities, particularly oil and gas exploration. The coldest, windiest place on Earth holds 60 percent of the fresh water on the planet. Recent expeditions to the Weddell Sea produced more than 700 new species, including giant carnivorous sponges. Much of the Arctic Ocean's complex life can only be seen by underwater explorers who dive through holes in thick sea ice. Much of the ocean here is dark, blocked from sunlight by ice cover, but photographers have dived with lights to expose underwater Arctic life. Scientists note that studying life in the Arctic Ocean can be difficult because the region is hard to access. Much is still unknown about the Arctic's marine food web. Plankton—a group that consists of tiny organisms like algae and bacteria—make up the base of the Arctic food chain. They convert carbon dioxide from the atmosphere into organic matter that in turn feeds everything from small fish to large bowhead whales. Growing inside the tunnels naturally carved into sea ice are plankton-eating zooplankton. Even farther below are bottom-dwelling organisms like sea anemones, corals, and sponges. Many animals that are often seen roaming the sea ice are also adapted for the water. Polar bears have large, paddle-like paws to propel them through the water, and they've been documented swimming for hours. Walruses have large tusks that they use to pull themselves out of the water, and they find much of their food by foraging along the sea floor. Whales and fish are often an important food source for indigenous people living in the Arctic, but commercial fishing has been banned in much of the Arctic Ocean. and nine other countries formally recognized that warming was creating new access to fishing stocks. In response, the 10 countries agreed to a moratorium that bars fishing until scientists are able to assess whether Arctic Ocean fisheries can be used sustainably. On 13 March 2019, Arctic sea ice appears to have reached its annual maximum extent. At 14.78 million square kilometers, it is the seventh lowest in the satellite record. It wasn’t a record low, but it continued a trend of declining sea ice maximums and minimums. The 2019 maximum extent is 860,000 square kilometers below the 1981 to 2010 average maximum of 15.64 million square kilometers and 370,000 square kilometers above the lowest maximum of 14.41 million square kilometers set on 7 March 2017. The Arctic Ocean is experiencing some of the world's most drastic warming from climate change. In recent years, scientists have measured dwindling ice cover as record high temperatures inch up and up. One 2016 study predicted that ships would be able to sail through open water to the North Pole by 2040. The loss of sea ice will affect more than just the Arctic, scientists warn; it could change weather patterns around the world. Some have even predicted it could lead to colder, more extreme winters. A jet stream called the polar vortex encircles the Arctic, propelled forward by the difference between cold temperatures to the north and warm temperatures to the south. As the Arctic warms, scientists say the polar vortex will become more unstable and likely to send Arctic air south. In 2018, the Arctic Ocean experienced its second-worst sea ice decline on record. Parts of Greenland were exposed to open ocean for the first time in millennia. Scientists predict that warming waters could hurt wildlife. Terrestrial animals like polar bears rely on sea ice to traverse the landscape in search of food and to hunt, particularly seals. Warming will likely impact zooplankton life cycles, and thus the myriad animals that prey on them. This video discusses who owns the ever-warming Arctic Ocean, which surrounds the North Pole of Earth. Find out how as the Arctic melts, it opens up new possibilities for fishing, drilling and shipping. But who owns the Arctic? And who gets access to these resources? Discover how Exclusive Economic Zones (EEZ) dictate the delegation of natural resources in the Arctic Ocean, and how the United Nations Convention on the Law of Sea (UNCLOS) can create more disputes than answers when countries have overlapping territorial claims in the Arctic Circle. The Arctic was once covered with a formidable mass of ice that posed a steep challenge to shipping. Now, as the Arctic Ocean warms and opens up, the race to control it is creating what some are calling a second Cold War. Shipping lanes through the Arctic Ocean could creating faster routes between countries, leading to fortune and power for those who control them. The U.S. and Canada both have a military presence in the Arctic, and China has recently expressed interest in expanding its influence there. But Russia and Norway have done the most to prepare their militaries and industry for more passable Arctic Ocean waters. Each country has been expanding its oil and natural gas operations in the region. The Trump administration has also pushed to launch oil drilling in the U.S. waters of the Arctic. Yet conservation groups like the World Wildlife Fund say expanding drilling for oil in the Arctic could further imperil the relatively pristine, and fragile, environment. Underwater noise from drilling can disrupt the many marine animals that rely on sonar or acoustic communication, the group says. And oil or gas spills—always a risk of industry operations—may be particularly hard to clean up and may have long-lasting effects in the cold climate. Several nations are vying for access to a new Northwest Passage, one that could run from Greenland across Canada to Alaska. It's a route explorers have been trying to navigate since at least the 15th century, but its treacherous, icy conditions have always stood in their way. In August 2007, the passage was free of sea ice for the first time on record.